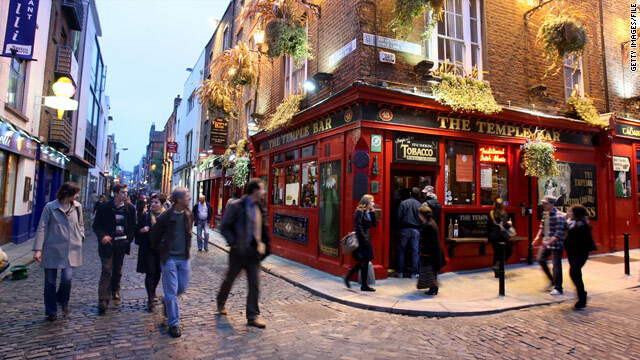 Pedestrians pass by Dublin, Ireland's Temple Bar. Ireland is stepping up efforts to attract visitors. (CNN) -- Bryan Barnett isn't taking any chances on his World Cup trip. Concern about volcanic ash disruptions in Europe prompted the Douglasville, Georgia, man to change his travel plans to Johannesburg, South Africa, to avoid connections in Europe. "I have USA - England tickets and had an Air France flight going out of Washington Dulles to go through Paris and then Frankfurt," Barnett said via e-mail. "Instead I cashed out all my Delta miles for the much longer and more expensive direct flight avoiding Europe altogether. Just to assure myself I wouldn't miss the game due to any volcano stuff," he said. Barnett, who works as a flight attendant for a charter airline, was delayed by volcanic ash for five hours in Frankfurt, Germany, last week and a longer route to avoid the ash added three-and-a-half hours to his return flight to Washington. Ash cloud concerns may loom over travelers flying to or through Europe this summer, but there could be some bright spots to the volcanic disruptions affecting the continent. Deals are likely to emerge for those who are willing to roll the dice on a less-than-seamless journey, said John Stachnik, chairman of the United States Tour Operators Association and president of Mayflower Tours in Downers Grove, Illinois. "I think the wise consumer will probably be watching for the advent of some bargains coming up to Europe," he said. Stachnik expects deals that last-minute bookers can't resist to turn up within the next 30 days. His business and anecdotal reports from other association operators show an uptick in overall travel sales, but a drop in Europe bookings, he said. "It's not that it's scaring people off, but what we've found is when people have their vacations, they want it to be as effortless and seamless as possible. And this is a potential roadblock for them," Stachnik said. The impediment is likely to stick around for months. The last time the Icelandic volcano producing the troublesome ash clouds erupted, in 1821, it lasted about 14 months, said Ian Skilling, a professor of volcanology at the University of Pittsburgh. Skilling said it's difficult to predict how long this eruption will last. Trying to forecast the weather and keep track of ash levels that vary almost minute-to-minute is difficult, Skilling said. "You've got two kind of chaotic processes kind of superimposed on each other, so it's difficult to say that one particular bit of airspace is going to be absolutely safe." Eurocontrol, the European aviation organization that coordinates the opening and closing of airspace, is confident that current guidelines are safe. Disruptions of the magnitude experienced in April are unlikely, according to Brian Flynn, Eurocontrol's assistant head of operations. "The traveling public I think can rest assured that the models that we have and all of the work that has been done over the last month, of the information that we have on the aircraft engines and the tolerable levels of ash means that the disruption will be minimized." At the worst stage of last month's ash crisis in Europe, about 75 percent of European airspace was closed. Through extensive analysis resulting in adjustments to the safe threshold for operating in volcanic ash, the same level of ash cloud now would only close about a third of European airspace, Flynn said. Still, that's a big unknown. In Ireland, tourism officials are aware of travelers' concerns and are eager to reassure visitors. Tourism Ireland has created an ash-related visitor charter, which more than 1,000 travel providers have signed since it was announced this week, according to Joseph Byrne, Tourism Ireland North America senior vice president. The charter includes an agreement to waive cancellation fees for ash-affected travel disruptions and to offer consistent, contracted rates should visitors have to extend their stays. "We obviously hope that none of this will have to be called on by anybody," said Joseph Byrne. "But for anybody who is worried, it's nice to know that the Irish government has actually encouraged the industry to come up with a charter and that the industry has actually responded in that immediate way." While ash has interrupted many travelers' plans, it doesn't seem to have had much of an effect on future bookings. Ireland travel providers are reporting better week over week sales this year than last year, Byrne said. He attributes the uptick to improving consumer confidence and the increasing strength of the dollar in recent weeks. Paired with that attractive exchange rate are deals that have been enhanced in the wake of the volcanic ash disruptions. "The values that were already very good have become even better," Byrne said. The country is keenly aware of tourism's important role in its own struggling economy and is campaigning and "paring prices to the bone" to attract as many visitors as possible. "It really is the year to pull out all the stops," Byrne said.